When Logan Woodside first arrived on the campus of The University of Toledo, he figured he would have to be patient. With senior Terrance Owens calling the signals and Alabama transfer Phillip Ely waiting in the wings, Woodside assumed he would be redshirted, and possibly wait in the wings for another year after that before he had his chance to become a starter. He was wrong. But then he was right. Logan Woodside has the most passing yards of any UT quarterback: 10,083 going into this weekend’s MAC Championship Game. Nearly five years down the line, Woodside’s career didn’t go exactly as he planned. But as he and the Rockets (10-2, 7-1 Mid-American Conference) prepare to play in the 2017 MAC Championship Game vs. Akron Saturday, he wouldn’t change a thing. Rocket fans are probably wishing time would stand still and Woodside could be their quarterback forever. He has set virtually every Toledo passing record in the books, including the most passing yards in a season (4,129 in 2016) and in a career (10,083 going into Saturday’s MAC Championship Game), most touchdown passes in a season (45 in 2016) and career (89), and many others. He has led Toledo to 28 victories as the starting quarterback, second only to the legendary Chuck Ealey’s 35 wins from 1969 1971. But the numbers hardly tell Woodside’s story. Woodside did not redshirt as a freshman — that came later. Injuries to Owens in 2013 forced him into the lineup for four games. A year later, Ely won the starting position, but an early-season injury put Woodside in the lineup. Under Woodside’s leadership, UT went 9-4 with a bowl victory. Only a 27-24 loss at Northern Illinois kept the Rockets out of the MAC Championship Game. Everything seemed to be going Woodside’s way. Until it wasn’t. The following season, Ely beat him out for the starting position for the second straight time, leading Toledo to a 10-2 season. Woodside sat out the entire season, using the redshirt year he thought would come in his freshman season. He has called that season the most difficult of his life. Since Woodside took over as the starter last year, it is hard to argue that there has ever been a more prolific passer to wear the Midnight Blue and Gold. He was named Mid-American Conference Offensive Player of the Year and the Vern Smith Leadership Award winner this season. The Vern Smith Leadership Award, named for the former Toledo athletic director, has been given annually to the league’s most outstanding player since 1982. Woodside is the fourth Rocket to win the award. This is his second consecutive season as a first-team All-MAC quarterback, the first Rocket QB to accomplish back-to-back first-team honors since Gene Swick, who was a three-time first-teamer from 1973 to 1975. In addition, Woodside has been named a contender for the Heisman Trophy in each of the past two seasons. It wasn’t the typical college football hero’s journey, true, but Woodside certainly made it a memorable one. And now, as the curtain is about to close on one of the all-time great Rockets, there is little doubt that Woodside has left his mark on the program. Head Women’s Basketball Coach Tricia Cullop has been named interim vice president of the Women’s Basketball Coaches Association (WBCA) for the 2017-18 membership year. 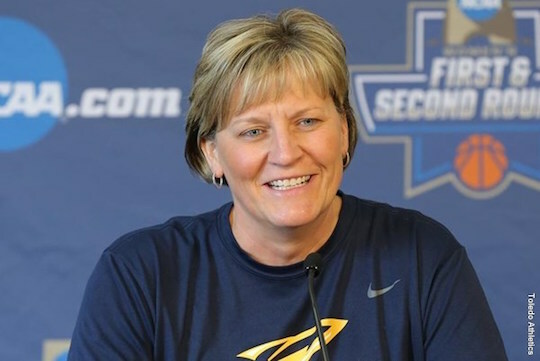 Cullop replaces former Emory University Head Coach Christy Thomaskutty, who resigned from the school for personal reasons. The vice president position will be permanently filled through the WBCA’s annual elections in the spring. Cullop and the Rockets return to the hardwood Thursday, Nov. 30, when they entertain Maine at 7 p.m. in Savage Arena. The University of Toledo Department of Music choirs will present three concerts this December, including one featuring a guest choir, the Children’s Choir of Northwest Ohio. On Saturday, Dec. 2, the UT Concert Chorale will perform “Abendmusik” (“Evening Music”) at 7 p.m. at First Presbyterian Church, 200 E. Broadway St., Maumee. This show will spotlight historical German church music to commemorate the 500th anniversary of the Reformation. The music of composers Johann Sebastian Bach, Franz Tunder and Hugo Distler will be featured. Guest organist James Biery of Detroit and UT student chamber ensemble musicians will accompany the choir. Tickets — $10; $5 for students, children and seniors — are available at utoledo.tix.com or by calling 419.530.2787. Tickets also will be available at the door. 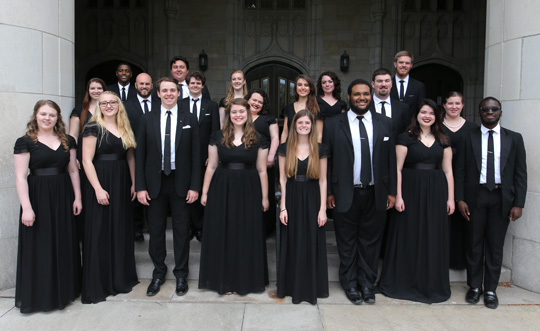 On Sunday, Dec. 3, the UT Concert Chorale will perform at the Toledo Museum of Art Great Gallery Concert at 3 p.m. The free, public show will include highlights from the chorale’s fall concert season. On Friday, Dec. 8, the UT Choirs and the Children’s Choir of Northwest Ohio will perform at 7 p.m. in Doermann Theater. A mix of holiday and secular music will be performed by the UT Men’s and Women’s Choruses, the UT Concert Chorale, as well as guest choir, the Children’s Choir of Northwest Ohio. The combined choirs also will perform “Sing dem Herrn” by German composer Michael Praetorius. For more information, contact Dr. Brad Pierson, assistant professor and director of choral activities in the UT Music Department, at 419.530.4558 or bradley.pierson2@utoledo.edu. Registration will close at 4 p.m. today, Nov. 29, for students to sign up to go to Detroit for the 2017 Mid-American Conference Football Championship with The University of Toledo Alumni Association. The UT Alumni Association, in conjunction with UT’s Department of Intercollegiate Athletics and the Division of Student Affairs, wants students to be in Detroit Saturday, Dec. 2, as the Toledo Rockets take on the Akron Zips. Support the Rockets in the biggest game of the year for $25. This price includes a game ticket, round-trip transportation, boxed breakfast, soft drinks/bottled water and other trip expenses. This UT Alumni Association sponsored event is for UT students only. Reservations will be taken on a first-come, first-served basis. A total of 416 seats are available. Student reservations only can be made online here. Emails and phone calls will not be accepted as registration. After making a reservation, students will receive an email confirmation. If you did not receive an email confirmation, your reservation was not submitted properly. If this occurs, contact Marcus L. Sneed, associate director of alumni relations, at marcus.sneed@utoledo.edu. Each student must make his or her own reservation online. Students who wish to sit with a group of friends on the trip must enter their names on the registration form, otherwise there is no guarantee the group will be seated on the same bus. The UT chartered buses will depart at 9:30 a.m. from Rocket Hall Saturday, Dec. 2, and return at approximately 6 p.m. Registration will begin at 8:30 a.m. in the lobby on the west end of Rocket Hall. Students are encouraged to be dropped off at Rocket Hall for the bus trip in lot 25. All trip participants will be required to show a valid Rocket ID upon registration and when loading on the bus. In addition, all students must provide a cell phone number that will be used during the trip. For students who plan to attend, a liability waiver and a travel expectation form must be completed and signed at the time of registration — no exceptions. And don’t forget to wear Rocket gear and show your Rocket pride at Ford Field! For more information, contact Sneed at marcus.sneed@utoledo.edu. 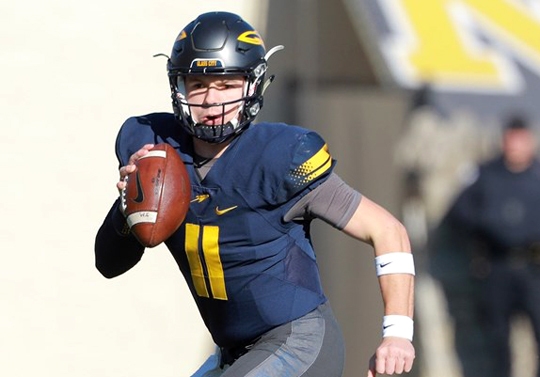 Senior quarterback Logan Woodside was named Mid-American Conference Offensive Player of the Year and the Vern Smith Leadership Award winner. Jason Candle was named the MAC Coach of the Year after leading the Rockets to a 10-2 record in his second year as head coach. The Rockets won the MAC West Division with a 7-1 league record and will play East Division champion Akron for the MAC championship title Saturday, Dec. 2, at noon at Ford Field in Detroit. Woodside was 225 of 345 passing for 3,451 yards and 24 touchdowns this season. His 3,451 passing yards leads the MAC and ranks 13th nationally, while his 24 touchdown passes also leads the MAC and is tied for 24th in the country. During his Rockets career, Woodside became the first player in program history to throw for more than 10,000 yards as he set the Toledo career passing record with 10,083 career yards and 89 career touchdown passes. His 10,083 career passing yards ranks 14th in MAC history, while his 89 career passing touchdowns is tied for seventh in league history. In addition, Woodside’s career completion percentage of 65.5 percent ranks third in MAC history. The Vern Smith Leadership Award, named for the former Toledo athletic director, has been given annually to the league’s most outstanding player since 1982. Woodside is the fourth Rocket to win the award. The others were Wasean Tait (1995), Bruce Gradkowski (2005) and Greg Mancz (2014). Woodside was one of seven Rockets who earned first-team All-MAC honors, the most first-team honorees in the conference. This is his second consecutive season as a first-team All-MAC quarterback, the first Rocket QB to accomplish back-to-back first-team honors since Gene Swick, who was a three-time first-teamer from 1973 to 1975. Sophomore Diontae Johnson earned all-league honors at three positions: wide receiver (first-team), punt returner (first team) and kickoff returner (second team). He is the first Rocket to make All-MAC at three positions since Eric Page in 2011. 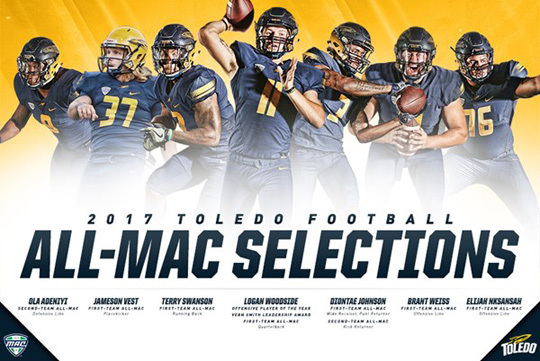 The other Rockets on the first team were senior running back Terry Swanson, senior offensive linemen Elijah Nkansah and Brant Weiss, and junior placekicker Jameson Vest. Junior defensive end Olasunkanmi Adeniyi earned second-team All-MAC honors. Johnson leads the Rockets and is third in the MAC with 63 receptions this season. He is second in the conference and seventh in the nation with 11 touchdown receptions. He is averaging 6.1 yards per punt return and 23.5 yards per kickoff return, and is fifth in the nation in all-purpose yards (159.1). Swanson has rushed for 1,139 yards and 12 touchdowns this season. He leads the MAC with 103.5 yards per game and ranks fifth on Toledo’s career rushing list with 3,377 yards. Nkansah and Weiss are part of an offensive line that has helped the Rockets to a MAC-leading 505.7 yards per game. Toledo also averages 38.7 points per game, second in the league and just off the pace set by Ohio (38.9). Vest leads the MAC and is second in the country with 24 field goals. He also tops the MAC in field-goal percentage, having made 24 of his 28 attempts (85.7 percent). Adeniyi leads the Rockets and is tied for third in the MAC with 16.5 tackles for loss, the most by a Toledo player since Mike Alston had 17.0 in 2006. Adeniyi leads UT with 6.5 sacks and is second on the team with 57 tackles. 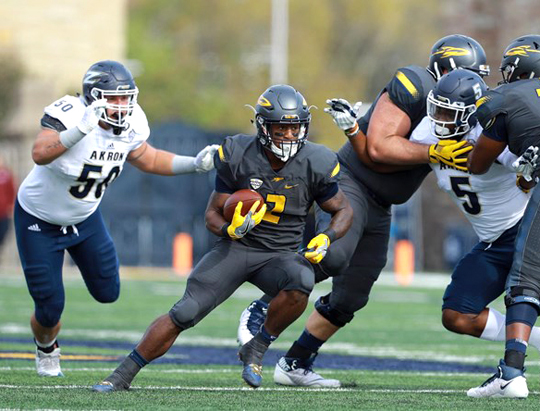 The Toledo Rockets have won one Mid-American Conference title, but they are certainly hungry for another. 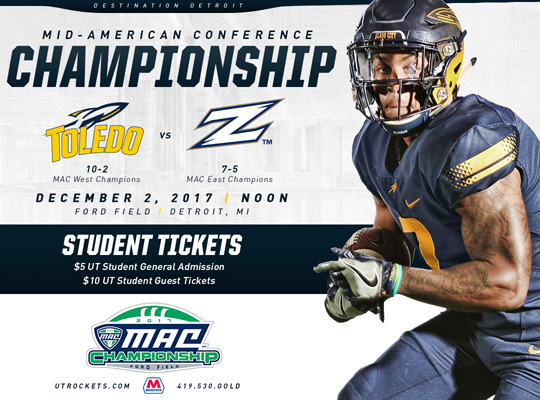 Toledo, winners of the MAC West Division title, will battle East Division champion Akron for the MAC Championship crown Saturday, Dec. 2, at Ford Field in Detroit. Kickoff is at noon, and the game will be televised on ESPN. Senior running back Terry Swanson rushed for 123 yards on 20 carries when the Rockets beat Akron, 48-21, during the regular season. Toledo (10-2, 7-1 MAC) defeated Western Michigan, 37-10, in the regular-season finale at the Glass Bowl Nov. 24 to earn a berth into the league title game for the first time since 2004. It was UT’s first outright division title since 1998. The Rockets clinched the title by following the same formula that has worked for them all year — a balanced offense combined with a stingy defense. Senior quarterback Logan Woodside threw for 300 yards and two touchdowns vs. the Broncos, while senior running back Terry Swanson added 94 yards and scored two scores. The defense held WMU to 275 yards of total offense, including just 98 yards in the first half. Akron (7-5, 6-2 MAC) made it to the MAC title game by winning its final two games of the season over Ohio (37-34) and Kent State (24-14). The Zips are led by redshirt freshman quarterback Kato Nelson, who threw for 322 yards in the win over Ohio. Akron, which has allowed just 24.8 points per game this season, held Kent State to 246 yards of total offense in the division-clinching victory over the Golden Flashes. The two teams clashed during the regular season; the Rockets defeated the Zips 48-21 Oct. 21 in the Glass Bowl. Toledo leads the series 11-9. Toledo picked up 13 points in this week’s AP poll and seven in the coaches poll. UT students: Click here to register for the bus trip to the MAC Championship Game. Rocket fans and UT alumni: Read about the pregame party and bus trip planned by the UT Alumni Association. During what has become an annual tradition brought to the University by President Sharon L. Gaber, 53 faculty members were honored in a special tenure and promotion celebration Oct. 30 in Carlson Library. Each honoree was asked to select a book that was instrumental to his or her success, and these books are now housed in the library — each marked with a bookplate commemorating the honoree’s milestone. 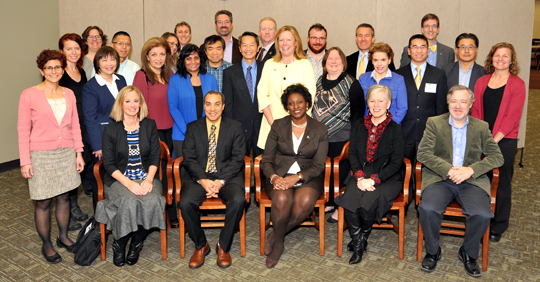 President Sharon L. Gaber and Provost Andrew Hsu, center standing, posed for a photo with some of the faculty members who attended the tenure and promotion celebration last month in Carlson Library. Faculty members who achieved promotion to professor are: Dr. An Chung Cheng, Holly Hey, Dr. Kamala London Newton and Dr. Joni Mihura, College of Arts and Letters; Dr. Debra Johanning, Judith Herb College of Education; Dr. Defne Apul, Dr. Cyndee Gruden, Dr. Dong-Shik Kim, Dr. Matthew Liberatore and Dr. Azadeh Parvin, College of Engineering; Gregory Gilchrist, College of Law (for academic year 2017-18); Dr. Hossein Elgafy, Dr. Michael Ellis, Dr. Daniel Rapport and Dr. William Suarez, College of Medicine and Life Sciences; Dr. Thomas Bridgeman, Dr. Deborah Chadee, Dr. Song-Tao Liu, Dr. John-David Smith, William Taylor and Dr. Jianglong Zhu, College of Natural Sciences and Mathematics; and Dr. Youssef Sari, College of Pharmacy and Pharmaceutical Sciences. Individuals appointed to professor with tenure are: Dr. R. William Ayres and Charlene Gilbert, College of Arts and Letters; Beau Case, University Libraries; Dr. Linda Lewandowski, College of Nursing; and Dr. T. Michael Toole, College of Engineering. Faculty who received tenure and promotion to associate professor are: Dr. Ammon Allred, Dr. Denise Bernardini, Dr. Jetsabe Caceres, Dr. Olman Piedra, Dr. Pamela Stover, Tad Weed and Barry Whittaker, College of Arts and Letters; Dr. Mark Gleim and Dr. Alex Petkevich, College of Business and Innovation; Dr. Liangbo Hu, College of Engineering; Dr. Jennifer Reynolds, College of Health and Human Services; Dr. Jason Huntley, College of Medicine and Life Sciences; and Dr. Song Qian and Dr. Akaki Tikaradze, College of Natural Sciences and Mathematics. Faculty promoted to associate professor are: Agnieszka McPeak, College of Law; and Dr. Mark Bonnell, Dr. Kathryn Eisenmann, Dr. Ehab Eltahawy, Dr. George Moukarbel, Dr. Joseph Sferra and Dr. Elizabeth Wroblewski, College of Medicine and Life Sciences. Those recognized for earning tenure are: Dr. Matthew Tull, College of Arts and Letters; Elizabeth McCuskey and Evan Zoldan, College of Law (both for academic year 2017-18); and Dr. Annie (Tsui Sui) Kao, College of Nursing. Dr. Mary Jean Ohns, College of Nursing, was promoted to assistant professor. 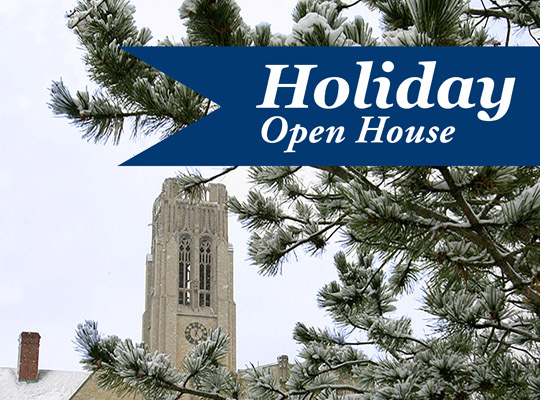 President Sharon L. Gaber is inviting faculty and staff to stop by a holiday open house Thursday, Dec. 14. Drop by the Sullivan Athletic Complex in Savage Arena between 3:30 and 5:30 p.m. to celebrate with colleagues. Cupcakes, coffee and cider will be served. RSVPs are requested by Thursday, Dec. 7; please reply to the invitation email. Rachel Burns is ready. She will face three college students for a chance to win $100,000 in the Dr Pepper Tuition Throw. The second-year student in the UT College of Pharmacy and Pharmaceutical Sciences will travel to Arlington, Texas, Friday, Dec. 1. She’ll have 30 seconds to see how many footballs she can toss into a hole two feet in diameter in a ginormous soda can five yards away. 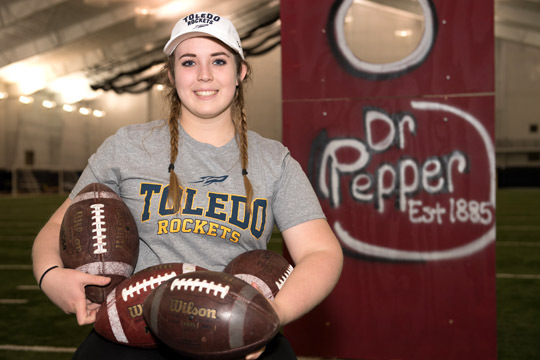 Rachel Burns practiced for the Dr Pepper Tuition Throw in the Fetterman Center. If Burns places first or second, she’ll move to the final round Saturday, Dec. 2, and vie for big money live on national television during halftime of the Big 12 Championship game at AT&T Stadium, home of the Dallas Cowboys. 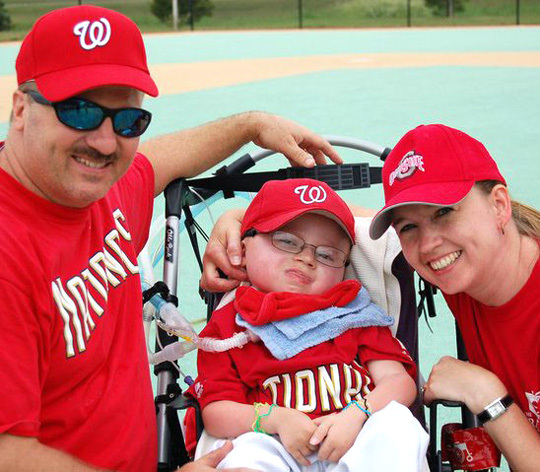 “My family has been huge football fans ever since I can remember. When I was 14 or so, I remember watching these competitions where kids would throw the ball through the cans to get money,” she said. She took her shot — and scored. In her one-minute application video, the Holland, Ohio, native shared her story. Life has been a blur since her phone rang Nov. 10 with the contest news. Rachel Burns posed for a photo in front of the Dr Pepper replica built by her dad and brother; her mom painted the can. Thanks to a diagram and dimensions supplied by Dr Pepper, her dad, Ray, had the oversized can built in less than two hours, with assistance from her brother, Raymond. They even made the can portable. 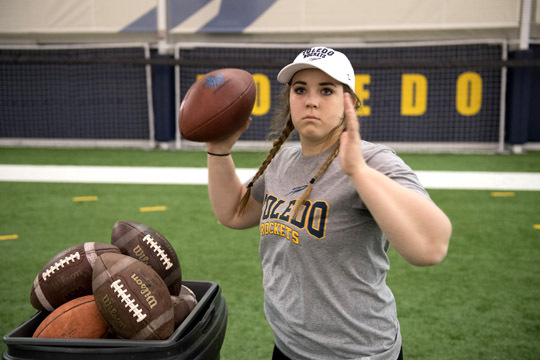 Burns has been practicing every day since — in her garage and backyard, at Springfield High School, and in UT’s Fetterman Center. The former softball and volleyball player is experimenting with a shot-put style throw. Twenty college students will participate in the Dr Pepper Tuition Throw, four at five championship games. All are guaranteed $2,500. Second-place finishers will receive $25,000, and winners will take home $100,000 to pay for school. • Burns and her family are lifelong fans of the Dallas Cowboys. • Ray Burns’ birthday is Dec. 1. And Dec. 2 is the birthday of Heather Burns, Rachel’s mom. • After falling in love with a puppy Burns was training for Rocket Service Dogs, the UT student organization of which she is president, the family brought home an 8-week-old chocolate Labrador retriever and named him Dallas just two days before learning about the competition. Dr Pepper will cover the cost of the trip for Burns and one person; she’s taking her dad.